TPC Publishing Talk Draws Packed House - Tricia Parker Communications, Inc.
Tricia Parker responds to lively audience member questions about publishing and book editing. 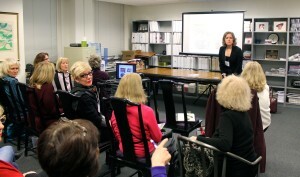 On March 5, more than twenty-five women braved the late Chicago cold to hear Tricia Parker’s talk on book publishing. Toward the end of the talk, Tricia urged the audience to contribute to literary culture by reading books and supporting authors. Audience interest was particularly high on the subjects of e-books, self-publishing companies, and how foreign authors can break into the US market.